This semi-waveless hardside waterbed mattress contains a 2 layer wave reduction system and 4 point memory stretch tethering system. A 15 year warranty reflects premium quality and workmanship. Includes FREE stand up liner and FREE waterbed conditioner. This semi-waveless waterbed mattress helps reduce pressure and body stress to allow you to experience a deep rejuvenating night's sleep. 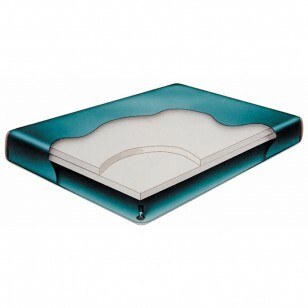 The Boyd Flotation Contura Form 2 Waterbed Mattress is made of high quality long-lasting virgin vinyl with a precision design and double reinforced corners for extra strength.This semi waveless waterbed mattress contains two layers of wave reducing fiber, providing approximately 60% motion reduction, while still allowing for a degree of motion and adjustability. For use in a traditional hardside wood box frame.